If you feel like there’s a critical difference, and you want to nail it down, you’ve come to the right place! In order to figure out the differences between content marketing vs. inbound marketing, let’s first lay out what each thing is. Basically, inbound marketing is a little broader and more robust than content marketing. The essential difference is that content marketing focuses on creating and curating the written content, while inbound marketing uses content as part of a bigger strategy that also directs people to your content through search engines and social media. Content marketing has more central focus, while inbound marketing has much more scope. Do I have to choose either content marketing or inbound marketing? Content marketing is one small, entirely encompassed piece of inbound marketing. After years of watching the two systems operate separately, many experts have weighed in and concluded that content marketing isn’t really an opponent of inbound marketing, but rather a slice of the bigger pie. If you do everything contained without content marketing, you may still not be doing inbound marketing; however, if you do everything contained within inbound marketing, you must do content marketing. Try to think of it like this: all chickens are birds, but not all birds are chickens. All content marketing can be inbound marketing, but not all inbound marketing is content marketing. Inbound marketing uses email, social media, design, and search engines as an integral part of the system. Without the proper production, packaging, and presentation for high-quality content, it’s just not inbound marketing. Also, inbound marketing can include focused, targeted ads through channels like Google, Facebook and LinkedIn to direct audiences to great content. This may seem like the old way of marketing, but since audiences still have to choose to interact with the ads, and it takes them to valuable content, it’s really just another strategic tool, like a search engine. Content marketing also uses many of the tools at its disposal, just secondary to the primary tenets of what content marketing does first: create excellent content for a well-researched audience. If you’re creating the world’s best content and you’re presenting it with an overarching strategy and all of your available tools, then you’re really doing both content marketing and inbound marketing. 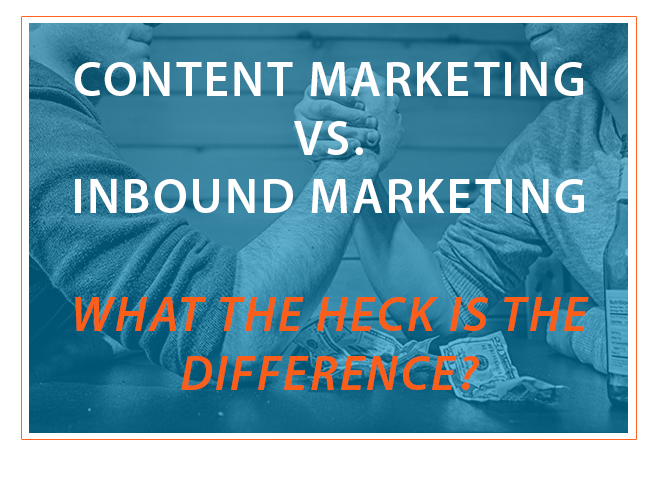 How can I use the difference between content marketing and inbound marketing to my advantage? If you’re marketer doing inbound marketing, you can study some of the guidelines of content marketing to make sure you’re really providing the best possible content to your audience. For example, Joe Pulizzi’s blog post suggests setting limits on what you write in content marketing to increase creativity. If you’re only doing content marketing right now, you can start using the tools and strategic focus of inbound marketing to really power up your marketing efforts. A lot of the content marketing community is starting to use the same ideas as inbound marketing, but just remember that for inbound marketing, strategy and presentation are built into the framework. Audiences have to see your content in order to appreciate it, so make sure it’s optimized to reach the right people. Your marketing department needs to be aligned with your sales department to achieve real efficiency and success. Good strategies are built from a good team with good ideas, which can’t be lazily mass-produced. We hope this cleared up the details and got you excited about using the best parts of content creation and inbound marketing strategy. After all, the reason this debate is so hot is because content marketing and inbound marketing are really taking the marketing world by storm. Our conclusion: if you choose inbound marketing, you get to do content marketing as well! Do you know how to ensure you achieve the biggest results with your inbound marketing? Answer: by having a solid inbound marketing strategy guiding your activities. Check out what a solid inbound marketing strategy looks like by clicking below.